I just rewrite the code for the MailChimp Import in order to sort the stats based on campaign date. Thanks to “Tubetto” for the hint! How to pull data from MailChimp campaigns (Open Rates, Clicks, and so on) into Google Data Studio? The question arised while creating a dashboard to report the results of email campaigns. The needings were to have all the data in one place, breaking data silos. But at the moment there are no connectors between MailChimp software and Data studio. The manual process to extract data and analyze it could be definitely time consuming. The solution is to find out a workaround using MailChimp’s APIs. Let’s think about the process of data extraction from Google Analytics. The key to read and manipulate data is to feed an Excel file or a Google spreadsheet. We choose Google spreadsheet to simplify and speed up things. And that’s exactly the solution to the problem. To include MailChimp Data into external tools you have to access MaiChimp account and generate the MailChimp API Key. Copy and paste the file into Google Spreadsheet Editor and click on Save, then on Run (play symbol). Accept all the authentication requests. Now your Google spreadsheet will include all the variables selected from the file. Obviously you can edit the array adding new data from MailChimp or remove it. Choose when you want to set the auto-update and save. Now we can pull data into Google Data Studio into a new report or in a report you have already in place, simply following visual instructions. From now on you can create graphs and tables including MailChimp data and exploit all the features Data Studio offers. This is of great help to monitor and keep under control your mail marketing campaign’s KPIs all in one place. Import Big Query data into Data Studio and run the report. Follow the steps for the data import in Google Spreadsheet and Google Data Studio. Believe me, it is simpler to do it than explain it 🙂 Any questions? Feel free to ask me. Is it just because I’m trying to get too much data at once? I have quite a bit of data I’d like to pull in, well over 1,000 rows … so I can see how that might be the case. correct, you’re exceeding the max API calls. 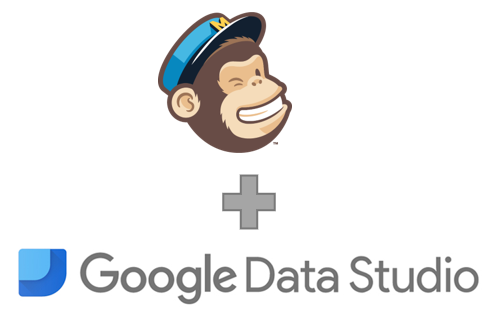 Here you could find an update regarding on how to importo MailChimp Automations’ data into Google Data Studio! Do you know how can I do the same by segmented list ? I’ve implemented the script as stated but I only see campaigns till last month and not the current month. Am I doing something wrong? Or do I have to make changes to the script? This is strange.. I saw all my campaigns..
could you please drop me a line in order to understand the issue? Can the problem be that it is a custom flow that I want to measure? Or shouldn’t that be a problem? What can I send you so you can help me? Perhaps you can e-mail me directly? Sure, I’ll send you a DM. Very helpful article. Can you show me how to modify the column for more ( or less) data? you need to modify the var section (e.g. 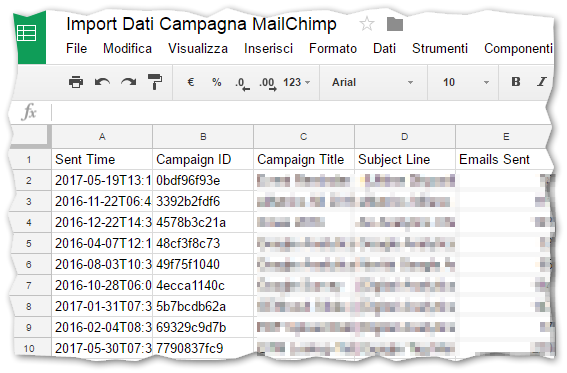 var campaign_title), the var report section and the columns name (sheet.appendRow). Hi! How can i import locations report into the sheet? do you mean a merge tag with location info or the Location under a contact info? Fixed. Inside the script, the sheet was called the incorrect name. Perfect. Happy that it works! I followed the steps as you have outlined. Once I ran the script I get a message that says “Running function my function” but nothing in the excel file populates. What did I miss? try to change line 6 with this var sheet = ss.getSheetByName(“CampaignData”); and rename your spreadsheet CampaignData, then launch the script. this is excellent…. thanks…. saved me paying for a third party to pull this data in! what syntax do I need to add to get the mailchimp list by date? Hi! Thank you for such a helpful script. I am not a coder and is just following details I see online. My question is that, I want to include another column which is the ‘List’ (list of subscribers). Now, my Mailchimp data has more than 10 lists (different client lists. For example, HKG for all clients in HKG, SIN for all clients based in SIN, TPE for all clients based in Taiwan). How can I show the exact list names (HKG, SIN, TPE) instead of ‘undefined’. Thank you! I have to take a look closely to the MailChimp API and find something that could help you. Could you importa orders and revenue information from mailchimp to google studio as well? yes you can. You only need to modify the file and set new variables. The same issue as everyone else – the code won’t run because there’s a error on line 25. Please help! could you please specify the error? I will update the script with your lines! After running the script. i am not receiving any data. Used the same file name also but then too it’s not working. the script still works in our spreadsheets. Do set the correct API Key and variables? Hi there. Do you think it’s possible to add a variable for the *|ARCHIVE|* link for a campaign? yes, you could add Archive. I had the same issue and I named the sheet MaiChimpCampaigns and the tab CampagneMailChimp and it works great! Please, do you know what is the problem? I am trying to use this for a SaaS business and for it to include our automated, on-boarding emails. This data doesn’t come through – just one off campaigns. Can you please advise on how to do this? I downloaded this and didn’t encounter any errors, but nothing populates the Google Sheet file after running the script? Does the fact that some of this code is in Italian impact English-using systems? Sorry, I am not a coder, I don’t know how this can be fixed. Could you please help? nevermind, I found the error, I haven’t named the sheet properly. I actually focused on the document and not on the sheet! Good to know you solved the problem. Hope you’ll find the file useful! I get the same error. Both the tab and the sheet are named MaiChimpCampaigns. Did you rename something in the script? Hy! I’m having the same issue and renamed the sheet to CampagneMailChimp, but still get the same error code. Any new ideas on what might be wrong? Hello! I’m having the same issue and renamed the sheet, tab and scripteditor to CampagneMailChimp, but still get the same error code in the 25 linha. I need to edit something in the script? I have updated the code with a new script. Could you please replicate every step listed in the post and try again?